The Earth Impact Database (EID) comprises a list of confirmed impact structures from around the world. To date, there are 190 confirmed impact structures in the database. The database was conceived in its earliest form when a systematic search for impact craters was initiated in 1955 by the Dominion Observatory, Ottawa, under the direction of Dr. Carlyle S. Beals. This was achieved via the study of over 200,000 aerial photographs of the Canadian Shield. Since that time the list has grown as new craters have been added. When the Dominion Observatory impact group moved to the Geological Survey of Canada (GSC) in the late 1980s, a more formal listing was developed. In 2001, following termination of impact studies at the GSC, the database was transferred to the Planetary and Space Science Centre at the University of New Brunswick, Canada. The site is currently managed by John Spray (Director, Planetary and Space Science Centre). Major contributions to the development of earlier versions of this database have been made by colleagues Richard Grieve and James Whitehead. Do you think you've discovered an impact crater? Do you think you've discovered a meteorite? Would you like to see a map of all terrestrial craters? Would you like to request an image (Note: a fee might be applicable)? Are you a scientist that would like to report data or publications? 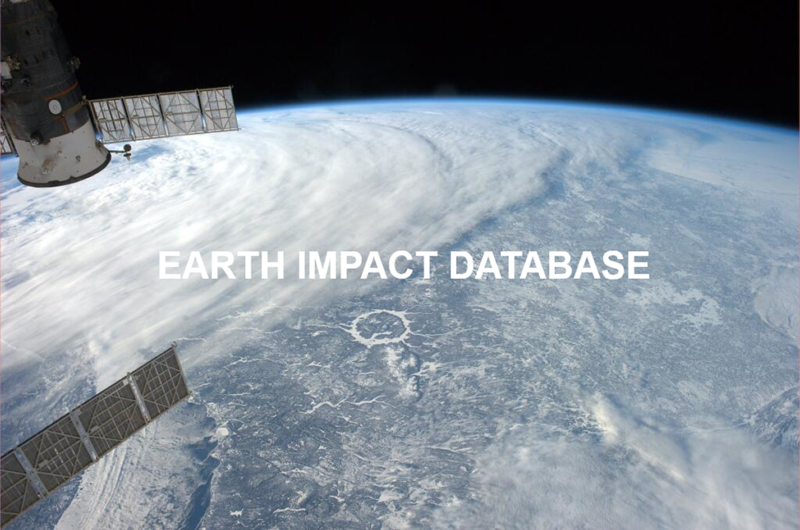 The Earth Impact Database is maintained as a not-for-profit source of information to assist the scientific, industrial, government and public communities around the world in furthering our collective knowledge of impact structures on Earth. We rely heavily on the science community adding to the knowledge base, such that the list is kept as current as possible. In this light, the database is operated on consensus, relying on scientific input from the community at large. The database is thus a dynamic document, with new craters being added as evidence is collected. Are you a scientist that would like to contribute to the database? Click here. Do you want a higher resolution image from the website? Contact PASSC. A small fee may be charged if the image is to be used for commercial purposes. We would like to thank the following institutions and individuals for their assistance by supplying imagery and information for the inventory over the last decade. Other submissions are acknowledged in the image captions. Please direct ALL crater inquiries to the Data Manager, Email Data Manager.